A lot of people remember their favorite dice games since their childhood. Back then we had plenty of time to spend playing with our friends and family. 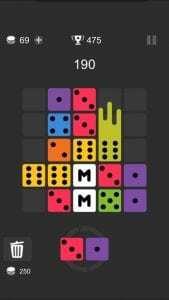 Now, in the modern world, it is really hard to find the time and stuff to play the real dice… However, our devices can solve this problem easily – just download the app. 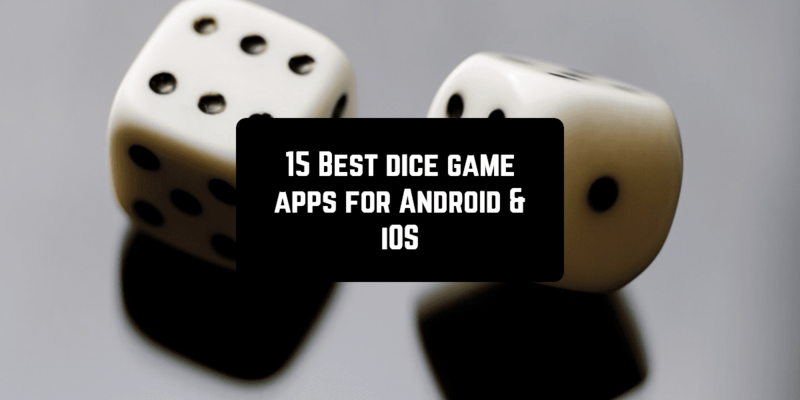 This review will help you to make the best choice – there are 15 best dice game apps. Some of them are more classic and some of them are quite modern and innovative. You can try them all, anyway. Whatever the dice game you are trying to find – you better use this review. 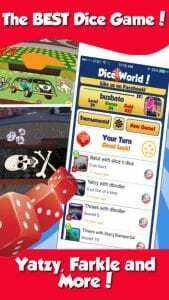 Dice World – 6 Dice Games! For those who are looking for a way to upgrade their time in tabletop gaming, classroom or school, or maybe you just like dice rolling – this game matches you perfectly. 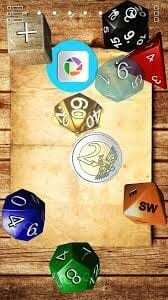 You can chose the appearance of your dice and change it to 2, 4, 6, 8, 10, 12 and 20-sided number dice. And this time everything is going to be as close as possible to the real life – graphics are very decent with shake detection and device gravity option. 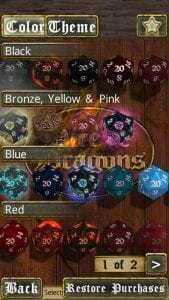 What is more, you can create presets of dice combinations to roll quickly. Drag to move and group dice, tap to remove or lock dice when re-rolling. If you want to vary your game process you can change the color of the dice and play two dice of different colors. Shake your gadget to quickly re-roll the current dice. Of course, the whole action is accompanied with sounds. Playing this game you will notice that it has detailed nicely rounded dice models with high-resolution textures, per-pixel dynamic lighting with bump mapping, reflections and soft shadows, clean modern interface. The choice of materials is wide – red, white, pink, orange, steel, obsidian, gold, or even glowing radio-active or magical dice. 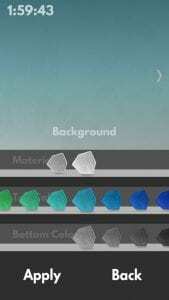 Moreover, you have a chance to chose your background. Remember how you were always losing the physical dice? Now you do not have to deal with this problem since you have the app 3D Dice. It allows you to play this game on your smartphone. 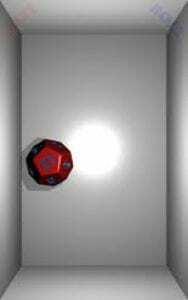 3DDice can simulate up to 15 dice. To throw them you need to shake your iPhone or you have to touch the screen. There are 3 types of dice and six different colors you can choose. You can choose different color and number. Among other things, the app will be great for those who prefer simplicity and focusing on game process instead of background features. You will not have to waste a lot of time trying to understand how to use settings and play. The whole game is played on the green background. In the lower part of the screen, you can see the sum of the points you got. This is one of the most popular dice apps on Google Play. You can set your own background, you can shake your phone to roll the dice. 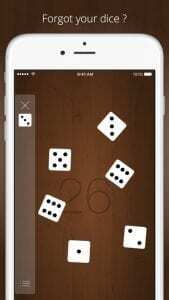 In this app, you have a six-sided wooden dice model and you can choose the endless number of them to play. 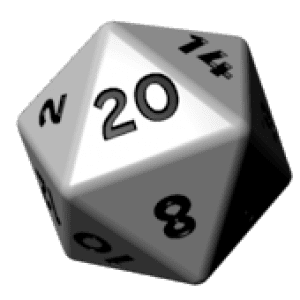 The app also has such versions of dice as 4-sided to 20-sided model. Of course, you can choose any kind of color you want. You can also lock and release dice, use a draggable dice. When you shake your gadget or tap on the screen the dice rolls with the vibrating sound of collisions. The total count is always displayed. For those who are extremely picky when it comes to gaming process there is a chance to chose the speed of rolling. The landscape is also supported and if you want to set your own picture for the background you have a possibility to do that. Graphics are easier to read and there is also an access to the game history. Remember that locked dice excluded from the total score. 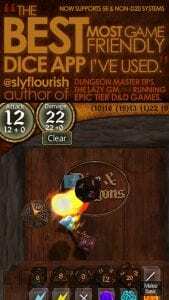 And, lastly, there is dice images scale to allow more items to fit onto your screen. Remember how often you could not play dice because of the lack of the stuff? Now you have this game. It can stimulate up to 7 dice simultaneously. As always dice are rolling when you shake the screen. If you are super lazy – the press on the screen to roll the dice. 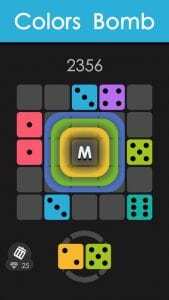 In this app, you can also pick up a color for each die. You can throw from 1 to 7 dice at once. If you want you can save your dice in the save bar. Left swipe to save all dice. Again, here you can choose the background you like in order to make your game process even more enjoyable. When you go to the settings you can see a pattern of colors to chose from. You can also choose a side to launch a dice and turn off the sound effects if you wish, All in all, this game is simple and playing it is easy and relaxing. 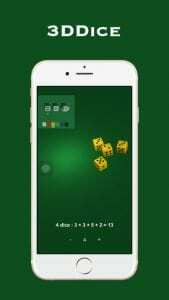 This app will make the dice game feel as real as possible. You will get any kind of dice you want. 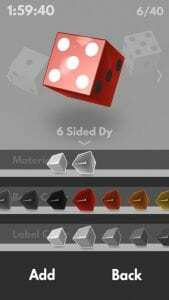 RPG players, Board gamers and D&D fans can use DnDice as a dice roller, just like in the real world. 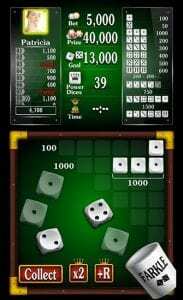 1) Dice Sum Mode – the final score depends on not only the sum of the dice but also on the modifier; 2) Number of Successes mode – the results of the game are built according to the priorities indicated in the initial settings. You will also get the full set RPG dice: d2, d3, d4, d5, d6, d7, d8, d10, d12, d14, d16, d20, d24, d30, d100, FUDGE/FATE. You can move your dice by gadget shaking, touching the screen with your finger or double tap. You can also tilt your device and the dice will also move (there is a customizable gravity strength). There is also a possibility to pause and resume the simulation. If you want to block a die or to change its color then hold your finger on it. All the results of your throws will be saved in the game history. Later you can share them on different social networks, such as Google+, Facebook, etc. The range of the dice set is huge – you can vary the color, style, opacity, number color and size. There are also many possibilities to chose the background. And the live wallpaper is possible to be added here. Unlimited dice can be added, it depends on your device. Of course, there are sound effects when dice collide or when you get your results. Swipe up or down with two fingers to hide the upper and lower interface. So this game is a dream come true for all dice fans! A classic game which allows you to enjoy all the fun of tossing physical dice without all that pesky math and adds a few tricks of its own. The distinctive feature of this game is when you toss the dice it leaves a trail of fire, steam, etc. 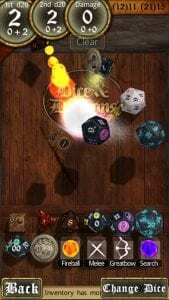 All you have to do is to combine all of the dice needed, numerical bonuses, sounds, and other information into a single combo die that makes appropriate sound effects. When you throw it, it dissipates into the multiple dice. You have several options to create the dice from. As always there is a possibility to choose a color for a die. You can make Attack Dice, Damage Dice, Bonuses, Defense which all will be hidden in one die in the beginning. Here you almost do not have limits while creating the dice of your dream, you can choose any features to personalize it as much as possible. The app will make all the math actions for you. If you want to save your combo die then click on the Character List. The sound effects are classical and there is no limitation for the number of dice which can be thrown simultaneously. What is more, the interface of the app is extremely good-looking and catches your eyes as you launch the app. 3D graphics are also amazing and when you play you have a sort of feeling that you are playing some adventure game, not just a dice game. 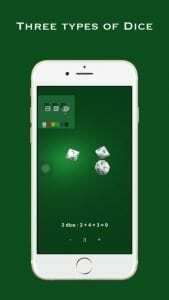 This app will give you a chance to play dice with all your friends. Actually, not only friends – you can play with random people if you want and it does not matter if they are a thousand miles away from you. The game process now has become awesome because of the improved interface, Biggest Winner events and premium tournaments! This free dice game consists of 13 rounds with the scorecard having 13 categories. You can roll the dice 3 times in each round and chose the way the scores will be defined. If this way was used before it cannot be applied one more time. 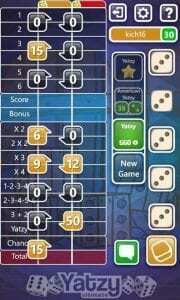 In order to win, the player has to roll 5 different kinds of dice and get 50 scores. This dice game is remarkable for its fun interface. Those who prefer everything extraordinary will definitely appreciate it. All dice are colorful and you can play with your friends! To start the game, use the shaker to roll the dice. You have 10 rounds in total and your goal is to win as many scores as possible. Each round starts with you throwing 6 dice. After each round scores are summed and added to the previous scores. Afterwards, either ends your turn at that time and bank the score for that round or continue to throw the remaining dice. 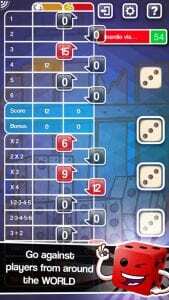 If you have the situation where you won all 6-scored sides of dice at once, then you get “hot dice” bonus and will get extra points. If none of the dice scores, you have the dreaded “Farkle” and will score a big “Zilch” for that round. So try to be better than the others. All rules are classic. You can play with random people or alone in the offline mode. You will find this app extremely addictive in each way.s by earning Achievements. 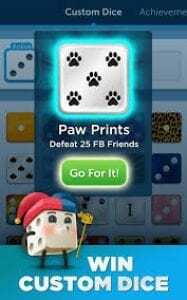 All in all, the app contains a lot of possibilities to make the game extremely exciting and multi-functional so everyone can select what they like. This is another version of a dice game. In the multiplayer mode, you have to gain more scores than your opponent, which means you have to gain nearly 7000 scores. In ‘Single Player’ and ‘Tournament’ modes you need to get as many points as you can in 10 rounds. You have 6 dice. In order to bank the points for your score, you need to accumulate at least 300 points. 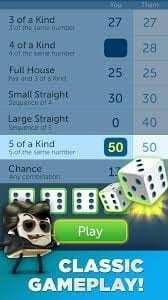 In case if you roll a Farkle three times in a row, you get -500. 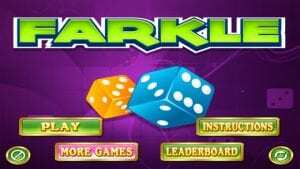 If you have not got a combination Farkle you get 0 points. The rules of this game are not exactly easy but as you understand the process you can master it. Create your account to put your name on the list of players. You have a green table background like a poker table and the scoreboard on the upper side of your screen. It shows your best points, prize, goal, power dices and time limits. One essential feature of this game is that you can stake and chase the desirable number of scores. All the combinations of dice you get are displayed on board. In the end, you can see the list of your goals and achievements and also the best players in this app. The most exciting dice game ever! Refresh your memories of the childhood with this app and set it in the way you want. Yatzy, Maxi Yatzy and American Yatzy modes will capture you for long hours where you can play alone or with a team. 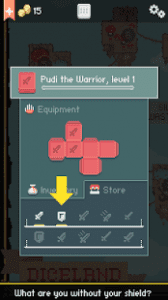 It is not a problem if you are new to this game – there are 3 levels of difficulty and also the notes, which will help you to make a progress in this game. You can practice your skills playing in the learn mode or with other players from the different countries of the world. If you like risks try Game IO mode. But if you prefer the calm game with your buddies then chose a Play&Wait mode and enjoy the game. 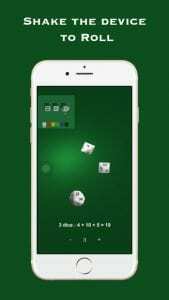 This app is one of the most popular dice apps. You can start your journey from the Noob Alley, play online games, stake, get IO scores and soon you will be a Titan on the Passage of Titans. Compile your own list of friends, add there friends and family or meet new people all around the world. Your friends will support you on the way to the victory. There is also an online chat where you can hold discussions. You can also use the Bluetooth to connect and play with your friends. Get everyday online bonuses and set the timers for online modes. You have an access to the game history and the global board of achievements. If you want you can share your records on every social network and, moreover, the graphics and sound effects are quite decent. 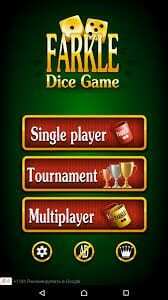 Prime Dice is the app created with the realistic 3D graphics to get the dice game as close to the real life as possible. It contains the whole range of dice (more than 12 kinds) which is enough for any table game. The setting is very convenient which make the gaming process feasible and fun. Again you can imagine and create your type of dice, choosing color, shape, etc. 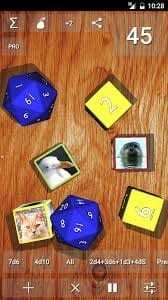 What is more, you can use pictures from your gallery to design the dice. 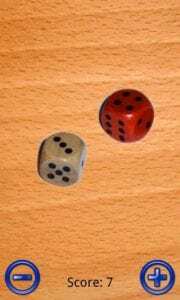 The number of dice which can be thrown at once is not limited, so you can throw them simultaneously or one by another. 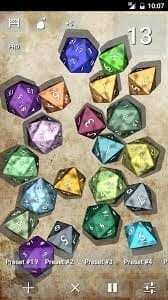 If you want you can save the sets of dice which you created. The app includes such options as a bonus, exploding, penetrating, drop lowest, take highest, target count, re-roll ones. 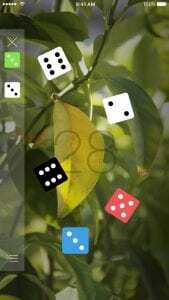 Besides, you can choose the size of the dice so they would be suitable for the screen of your device. 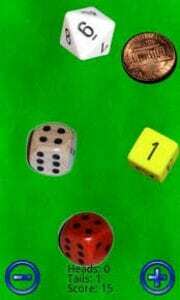 In this game, you have 7 different tables with different backgrounds and dice. Touch a die and block it, regulate the gravity in the game, watch the game history. The interface is quite simple but you can always change it by choosing the wallpaper from your gallery. 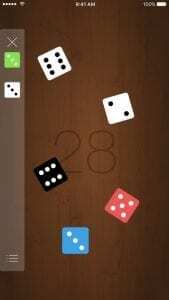 This is not exactly a classic dice game, but still, it is a very captivating app. 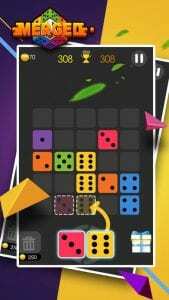 In this game, you have to use the dice to create blocks. Actually, this app is similar to that one with jewels where you have to put them together so you could remove them and gain scores. As you launch the app you can see in the lower part of the screen you can see photos of the best players of Merged!. This is a quest where you have to arrange all the dice in the right position in order to make a block and win. To do that you need to place dice of the same color and number together. It is possible to turn the dice. You can regulate the difficulty of the game – set the time limitations, chose the immortality, etc. In general, it is an extremely simple game which will help you to distract from your problems and relax for a while. Or, if you want, it can be a competitive game – just in case if you want to limit yourself to time or play with other users. This is a curious app which, again, has nothing to do with the original dice game, but if you like the idea itself then you can probably like it. 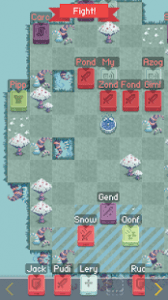 Dice Heroes is an RPG strategy where the main characters are dice! The story is quite common: the dark times came to the land of dice and the dark dice conquered the land of Cubestria. But one by one, the representatives of the divided races have to unite in order to take the control back. You have to unite them into the resistance group. The game includes 58 locations of the world of dice, there are different kinds of enemies and allies with their unique possibilities and powers. You can also use poisons and craft. Of course, there will be battles with the enemies. But there is also a chance for planning your own strategy with the element of surprise. If you want, you can always save your progress in the cloud. The graphics are made especially for this game so it has the pixel style in order to achieve an effect of the 90-s games. Your dice will be traveling around fighting the enemies and collecting bonuses. 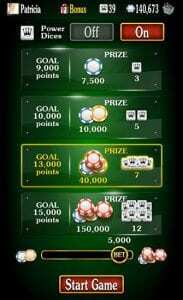 If you plan everything correct you can win and collect a huge quantity of rewards. 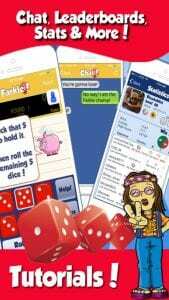 This app combines 6 different games: Yatzy, Farkle, Pig, Threes, Balut and 24, so you can choose anything you like and play without the necessity to switch between the applications. 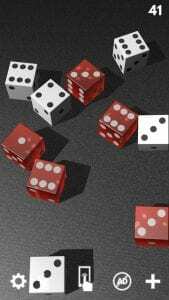 You can play the realistic 3D dice which is made according to all the rules of this classic game and works in accordance with the real physical laws. 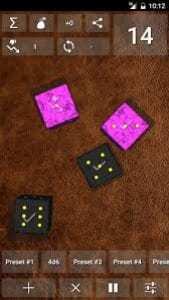 No more random number generator to determine the dice results. You have 10 locations to play in. What is more, the game includes more than 100 new Trump’s quotes spoken by a comedian J-L Cauvin during the gaming process in order to make it even more fun and interesting. There is also a possibility to play against your friends. In another case, you can play with the computer, play tournaments, play however and whenever you want. The computer plays a role of Trump, by the way. You can use your social networks and invite your friends and followers to play with you, but you also can play against the random opponents. Moreover, there is no need both players being online at the same time – another player can make his turn later. All your achievements are recorded and you also can see the list of the best words players. The app has also a chat where you can ask your questions and a special mode for new players who start learning the gaming process. 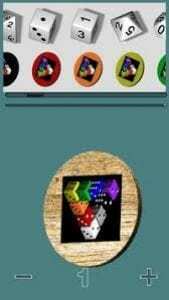 Besides, it is possible to control the Dice World app by the voice. 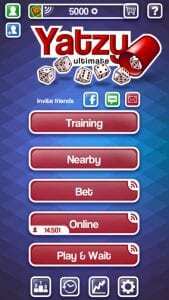 This app is made for those who really understand the game of dice and who is not new to it. 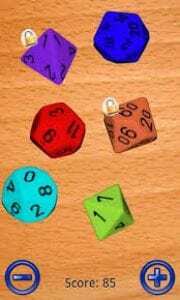 You can choose a 4, 6, 8, 10, 12, or 20 sided die. To throw dice you need to shake your phone. The developers put a lot of attention to the details of the dice to make them as real as possible and completely fitting into the game. The sound effects match perfectly with all the action happening in the game. You can choose the size, color, and a number of dice by yourself according to your preferences. There is also a score counter for the fast read. The interface is simple but stylish, it is possible to say that it includes all the necessary features for the dice game. What is more, the setting is really easy inconvenient right in front of your eyes so you do not have to spend a lot of time trying to understand the options of the game.